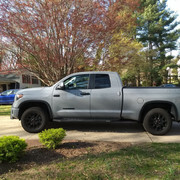 My 'cage' is a 2017 Toyota Tundra TRD PRO. My first (and only) truck and love it. So while I was in San Antonio for work, and took a ride down to the Factory. As luck would have it, I arrived just in time to get a tour of the factory. Overall an interesting experience, my first tour of a modern auto manufacturing plant. A few takeaways. - Orientation video presentation was dated (2005-5006), all vehicles including the lead/tour truck were last Gen Tundra and 2 generation old Tacomas. Not a drop of info on future models or innovations. No real displays in the 'learning center' no brochures, or future development glam, brochures, etc. It was pretty spartan in that regard. - Tour of the factory is by seated trolley that takes you around the factory floor, mostly focused on final assembly and a brief look at the body stamping and plastic injection mold areas. Engines arrive about 80% complete from their plants in Alabama and Arkansas. - Very clean and orderly system, lots of happy faces and a real interesting process that includes conveyors, human trolleys and robot shuttles moving parts all around the factory with an 'on time' process that only keeps what is needed for a 2 hour block of time ready at hand. Seemed very efficient. - Was interesting to see Tacomas and Tundras of all manner of color and configuration rolling on the lines, and amazed to see how all the needed parts were on carts or cradles and synced perfectly. Only saw one PRO model Tacoma and Tundra while on the tour, and I really liked seeing the chassis frame and suspension assembled sans body. Also saw how they attach the cab & bed to the frame. Both are lowered at the same time and with a healthy clunk perfectly placed. Process is so precise they are able to do it with the bumpers ALREADY bolted to the frame. Body and bed drop right in as a unit.... Very impressive. - According to the tour guides a new Truck rolls off the line every 60 seconds, and the plant is open 5 days a week running on two 8-9 hour shifts, with maintenance and checks in between. Plant shuts down 2X a year for model year changes, and upgrades. -Most interesting fact for me was Toyota does not build and store/hold onsight, then sell, they only build what is already committed/sold, and every truck is shipped to its destination within 24 hours of rolling off the line. Of course dealer networks have set patters of what they buy, and how they configure vehicles largely for their market, but I found it intriguing that Toyota builds to order, pre-sold, not builds and tries to sell. To me this makes ordering the Exact truck you want possible if you can get with a dealer before their ordering cycle. This is likely why we dont find a ton of left over Tundras on dealers lots (like Chevy Ford, etc). At least that is what they are claiming. There is a second Tacoma plant in California to meet demand. Tour lasts a bit over an hour, and was interesting, but NOT worth a major diversion or intentional trip. You are supposed to make a reservation before arriving, but they had nothing all week when I called, but decided a walk on was worth the attempt. Worked out for me. What didn't was getting to the airport only to discover my flight (737-800M) was cancelled. Now courtesy of American Airlines I get to spend the night at the Hilton and fly home tomorrow. I had a 2010 and now a 2017 also. Love them. Build to order, that's why if you can get a 10% off deal you did very well. And why the resale is so good. I suspect there are more US made components in a Tundra than in the Chinese Chevys. let the hate mail begin. Vehicle final assembly plants are no longer all that interesting IMHO - all the real work is done elsewhere. A few years ago I toured the VW Phaeton plant in Dresden and it was less an interesting industrial plant than a VW PR stunt. Guzzi in Mandello is still interesting, especially given the history, but less so than 20-25 years ago. 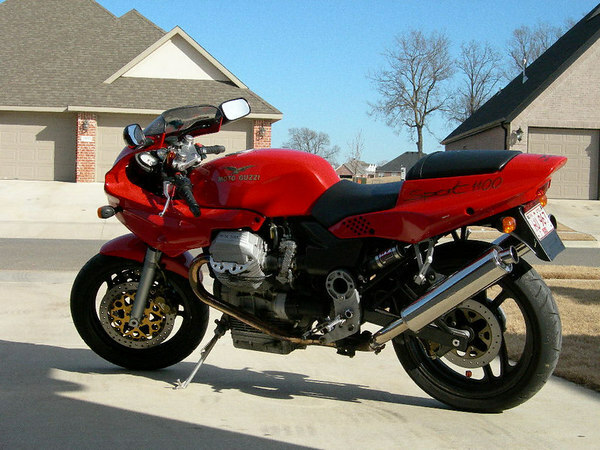 A friend worked for Ducati Corse and gave a tour of the plant, a few years pre VW. It would have been interesting if he'd been able to take us into the race shop but otherwise not too memorable, and the museum is nothing compared with Mandello. I think they also make the frame, bodypanels, paint, and all the interior pieces onsite in the factory as well. They mentioned a whole wing with onsite shops for interior, seats, trim, and all plastics molded on site. No tours of the manufacturing areas though. My 1st Toyota was a 2000 Tacoma SR5 xtra cab 4x4 I bought in 2003 w/ 26,000 miles on the ODO. Kept it 14 years and sold it with 80,000 miles on it within 2 days to a guy in Kansas. Truck ran great but after 14 years I was tired of looking at the same vehicle. The old Tacoma was replaced it with a new 2017 Tacoma TRD Sport 4 door and what a difference 17 years makes. The 2017 has a 130+ HP advantage over the 2000 much more comfortable and get better fuel economy. Earlier this week the wife and I have started looking at 2019 4-Runners SR5 Premium to replace her Honda CR-V.
Sure, you can order, but don't expect to configure it exactly how you want it. My huge frustration with manufacturers is that you can't mix and match features. You want adjustable lumbar support? You have to buy the upscale model and pay for all the other crap you don't want. You want the big engine in a "work truck" package? No, sorry, that is reserved for the top of the line model. Trucks today have become luxury vehicles and most people rarely if ever haul or tow anything with them. Maybe it's a regional thing. Not really true, in my part of the country. 20 years from now the roles will be reversed just like the cars. They deliberately take there time rather than rush in to take the market by storm. mid-size and full-size trucks have different customer demographics. So far, the Japanese are selling their full-size trucks to their former mid-size owners. They're not really breaking in to the traditional full-size demographic. The Japanese have owned the small to mid-sized truck market since the 1970s. Full-size Tundra and Titan have a LONG way to go. 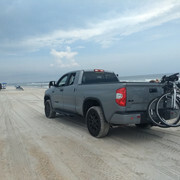 When Toyota released their second generation Tundra in 2007 it equaled or beat all of the gas powered 1/2 tons in just about every category including the 11,000 lb towing capacity and gas mileage. Only the diesels beat it. Since then they have added little and the others have upped the ante. Unfortunately Toyota never put the build quality into their trucks like their cars. 5.7 motors had an issue with emissions systems that could cost their owner well over $5K to fix if past warranty and the frames still had the rust issue of the early 2000s Tacomas. My 2007, with all its flaws was still far better than the 4 Fords I had before. Except the one that counts: sales. and 12 years later, that fact remains. They simply cannot sell full-sized trucks competitively in The USA. Where I am fully loaded crew cab short bed trucks far outsell the competition and the number of 3/4 ton fully loaded crew cab diesel trucks that don't even have a hitch in the receiver is astounding. They have become status symbols. I was getting work done on my wife's little buick and the dealer gave me a $60,000 truck as a loaner. That truck even blew cold air up your arse! My first house cost just over $60k. the number of 3/4 ton fully loaded crew cab diesel trucks that don't even have a hitch in the receiver is astounding. I remove the hitch coupler from the receiver every time I unhook my trailer. Keeps people from banging their knees and getting greasy. Pull the pin and either put it in the trailer, or in the bed of the truck. So, you might look scornfully upon my GMC 3500 dually, since it can be seen occasionally with no trailer, and with no hitch coupler in the receiver. I believe Illinois has a law about leaving the hitch in the receiver that will side with the pedestrian who bangs their leg and/or soils their pants on the hitch in a parking lot and files a claim. My Tacoma is one of them. Of course I don't own a trailer so why would it. The big thing around here is to have a 10" lift on your $98,000 coal rollin' diesel truck with a 15" drop 1-7/8" ball hitch for pulling you 4x8 ATV trailer around. I've had company E350 & F150 work trucks since 2004 that I've driven 100's of thousands of miles combined and I can think of only maybe 4 times total I've had a trailer connected to any of them. My wife and I just pick up an 09 Tacoma SR5 2WD 4cyl with 98K on it,except for the soft brakes it drives like new. Light years ahead of my old S10, well except for that 4.3 motor in the S10 but we sold the boat so it should be okay. The 4cyl will run forever but they like gasoline. My 2.9l got 18 to 20mpg highway and 16 in town w/ a manual transmission. When it came time for me to get another truck in 2017 I didn't even consider another manufacturer. Hell I didn't even test drive the new Tacoma's before I bought it. I was an Ops Mgr in Hazmat up until 2013, we used mostly GMC & Chevy 2500's & 3500 4 x 4's as field/work vehicles. We had a brand new Toyota Tundra as our office vehicle that I used to run errands, and to run equipment to different teams in the field. The Tundra was a pretty nice truck and drove well, but it got the worse fuel mileage of any truck that I have ever owned or used in my life. Going down I-4 or I-75 you could practically watch the fuel gauge slowly drop, especially if it was towing a trailer. That was really my only and last experience with the Tundra. I took it into the dealership twice in that first year and both times it was diagnosed as normal. Hopefully they've gotten better since then. Nobody ever accused Toyota trucks of getting great fuel mileage. When it comes to cars and trucks, there are three things I take into consideration: Reliability, reliability, and reliability. 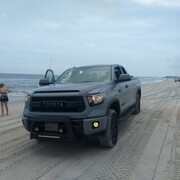 I've owned 4 Toyota pick-ups. One T-100 and 3 Tundras. In 400,000 miles (and counting) of Toyota ownership, I've had exactly one mechanical problem, a fuel pump failure (T-100) and thats it. Just oil, brakes and tires. I put 200,000 miles on a 2000 GMC Sierra 4.8 and never saw a mechanic. It still had 50% of the ceramic brake pads left and I hauled and towed all the time. My 2008 GMC Sierra 2500HD 6.0 has just over 100,000 miles and 90 percent of those miles are towing a horse trailer with 2 to 3 horses loaded. The only mechanic job was when a rock took out the AC. I have a 2017 Nissan Frontier 4.0 with 20,000 miles mostly used to tow my enclosed motorcycle trailer on work trips. Starting to smell a little coolant that I now have to figure out before I bring it in for hopefully warranty work. I chose it over the GMC Canyon because it was $8000 less comparably equipped. At work we turned a toyota tacoma and a nissan frontier into robot vehicles and most of us agreed that the Nissan was the better truck. 2019 4Runner SR5 Premium sales are up by one as of about 10:30am this morning. Back in my younger days I used to change my own oil, brakes, etc. Had the creeper, jack stands, etc. All that stuff is gone now. Let the dealer put it on the lift. When it comes to cars and trucks, I've become my father...I remember him saying about the last couple of SUV's he owned, "I've never even seen the engine, don't even know if it has one!" I still wrench on the bikes, because everything is easy (mostly) to get to, and I can still lift the parts! I think for the most part, the reliability of full size pickups is pretty equal, particularly the GM and Ford, and Chrysler is making progress. I had narrowed it down to one model of GM and Ram, didn't like the Ford at all. It was going to be a Chevy 2500HD or Ram 2500 with blackout kit, the Sierra AT4. Sierra was in the lead till a buddy had me look at the Tundra. The only model I would have bought is what I bought, a Double Cab Cement TRD PRO. If they didn't have that exact truck, I'd be driving a Sierra. I diddnt like the ginormous chrome grill, and basic styling of the Tundra, and the standard ride was too stiff and jarring. This color, blackout paint scheme, body colored bumpers (and what a color) 2" factory lift and special shocks/springs with a factory dual exhaust was the perfect combination. Less important, the seats are black leather set off with red stitching. Not that important, spot on for me. Glad I found it, as I think the 2019 model has terrible color options and the goofy hood bulge looks tacky. But hey, No criticism, I got what I wanted, and if anyone likes or doesn't, no skin off my nose. Be happy with what you have! I'm buy no means a fanboy, and not only is this my first Toyota, but my first truck, though my wife had a little Toyota pickup when we got married, but I made her trade it for a 1st GEN VW GTI, and I sold my Cutlass. I really like the Tundra, has all I want, and nothing I dont. I added heated seats front and back row, and have 30K on it, averaging 17MPG for my 100 mile round trip commute. Plan to keep it till I cant drive. My dad always had a truck, over a 40 year period, had 3 Chevy Silverados, my Uncles both are Horsemen, and have Big 4 door Duallys, some Ford, Some Chevy, and one has a Ram Farrier Rig with custom cap. All have been mostly reliable 200K mile plus vehicles, though the Ram transmission $h!t$ the bed every 75K. I dont ding it, it is what it is.